Are New Regulations To Crackdown On Airbnb Landlords Enforceable? Ireland’s housing minister Eoghan Murphy wants to introduce new laws for short term lettings. It is not the first country or city to introduce regulations to try to combat housing shortages. London has a similar regulation that restricts the long term use of these short lettings but how enforceable are these regulations? The original intention for Airbnb was for homeowners to share part of their home or all of it for a short period of time to help pay the bills or extra treats. 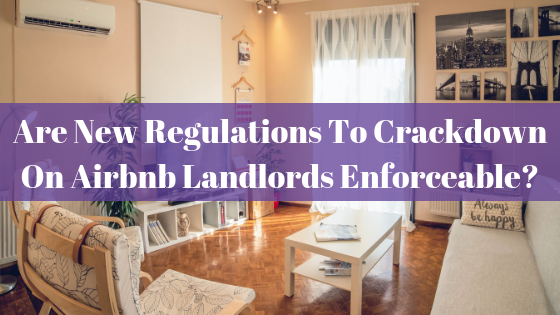 These new regulations are being introduced because now landlords who used to rent out to long term renters are taking their properties off the market in order to put them on Airbnb and other short term rental sites. This is causing a shortage of long term let properties as the availability has gone down and is also increasing the prices for long term rentals. Even in London a regulation was brought in a few years ago which stated that you can rent your property out for 90 days per year, if you want to rent it out for longer you need to apply for change of use. In Northern Ireland one needs a licence to offer overnight accommodation. The licence cost £40 so it isn’t prohibitive. Recently Tourism NI started legal proceedings against two men who have been offering their properties on Airbnb without a licence. They could face a £2,500 fine or a six month prison sentence. In Ireland they are proposing that a homeowner could rent out part or all of his primary residence for a maximum of 90 days per year. This would also be limited to 14 consecutive days. Landlords with second properties who want to rent out to the short term market will have to apply for special planning permission. In certain parts of the country like Dublin and Cork where there is a shortage of long term rental properties it is unlikely that permission will be granted. If you are already a landlord renting to the long term market maybe you have already considered taking it off of the long term market and renting to sites like Airbnb. Keeping within the regulations for your area is part of the consideration. The cost of voids (having the property empty), damages, meet and greet plus cleaning costs can quickly out weigh the benefits the higher rent. Often times keeping it rented all year round to a single tenant, who looks after the property is a better proposition. At Purple Hat Property we can help you consider both options and if you want us to manage your property on a shorter term let, we can help you with this. Whilst the idea to bring back properties available to the long term market sounds like a good idea, someone renting out part of all their own home will not affect the property market. If property owners only have to register if their property is being rented in excess of 90 days, what is to stop them renting it out for longer? It also brings up the question of enforceability, if properties are not registered, how will the authorities know if a property is rented out for more than 90 days? Are they expecting Airbnb to inform them of the rentals? Whilst the principle seems a great idea the practicality of enforcing these regulations are going to be fairly impossible. If you are a landlord in Essex or East London and want to rent your property on the long term market and would like a detailed appraisal on your rental property then enter your name and telephone number in the box on the right.